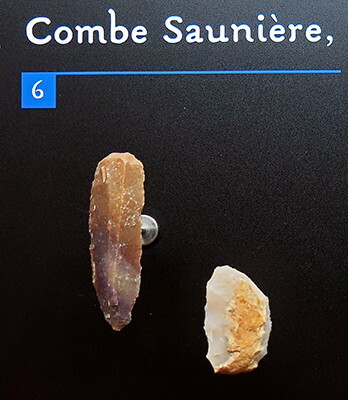 The site of Combe Saunière was excavated by Geneste and Chadelle between 1978 and 1996. It consists of an ensemble of caves, the principal one containing a long sequence of Middle and Upper Palaeolithic deposits. The cave is situated in an open environment with small valleys and a few low cliffs with habitable caves dispersed along the river edges. Movements of human groups would have been easily possible in all seasons. The principal locus contains a stratigraphy five metres deep that begins with a sequence of Lower and Upper Wurm deposits (isotopic stages 5 to 2), followed by several Holocene episodes. At the base of the stratigraphy, a sequence of Middle Palaeolithic deposits, dated by ESR to between 100,000 and 60,000 BP, is underlain by a substratum consisting of limestone in some areas and karstic sands in others. 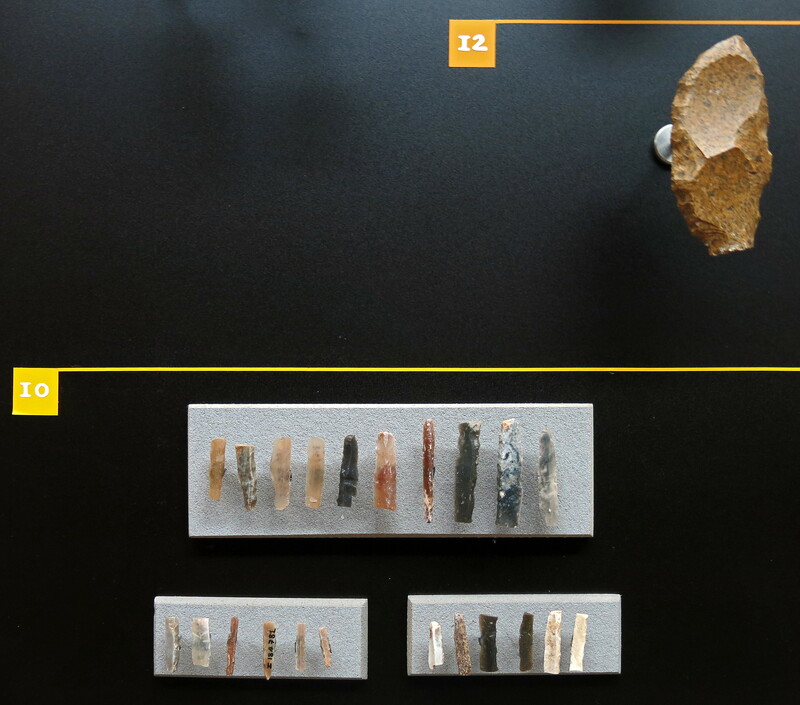 This sequence is overlain by Chatelperronian, Aurignacian, Gravettian and Solutrean levels, ending with levels containing a few Magdalenian objects. 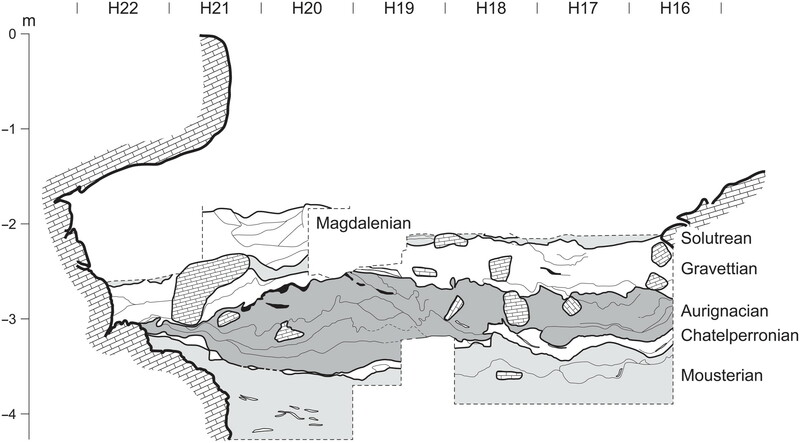 The radiocarbon dates of these levels extend from 38,000 to 14,000 BP. 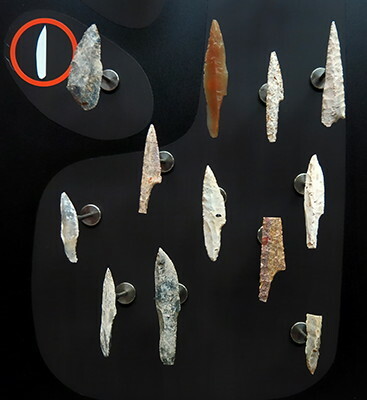 The Solutrean levels are dated to approximately 19,000 BP. 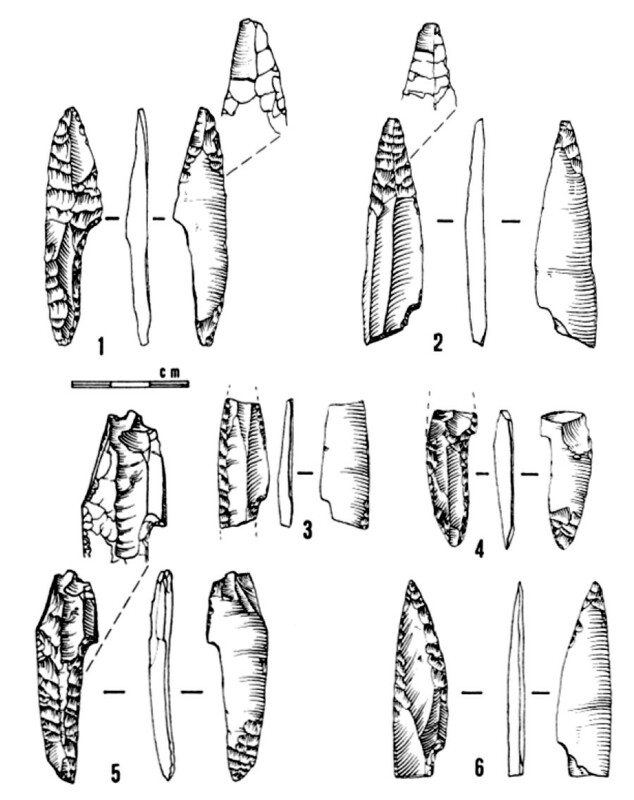 The sedimentary sequence containing Solutrean artefacts consists of three levels of variable thickness. 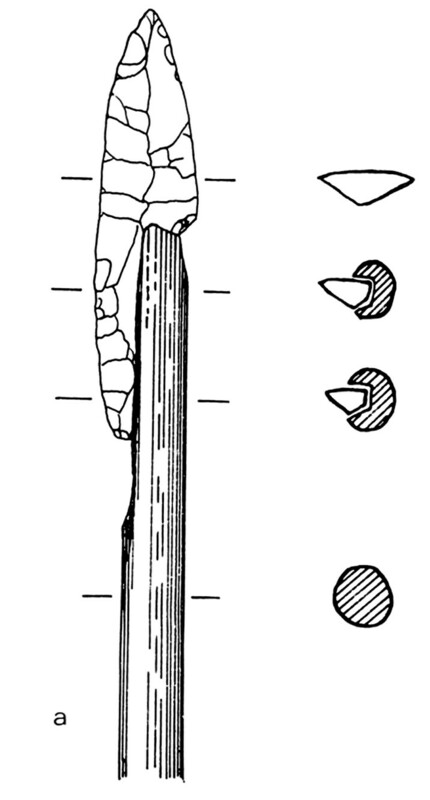 The basal level (IVc) is 5–30 cm thick and is greatly disturbed by human activities. In some locations it fills in depressions in the directly underlying Gravettian level. It is overlain by a second level (IVb), 10–50 cm thick, and a third thinner level that is more significantly disturbed (IVa). Combe Saunière, 45.225922° N, 0.877655° E, elevation 168 metres. Geology of the region within 3 or 4 kilometres of Combe Saunière. 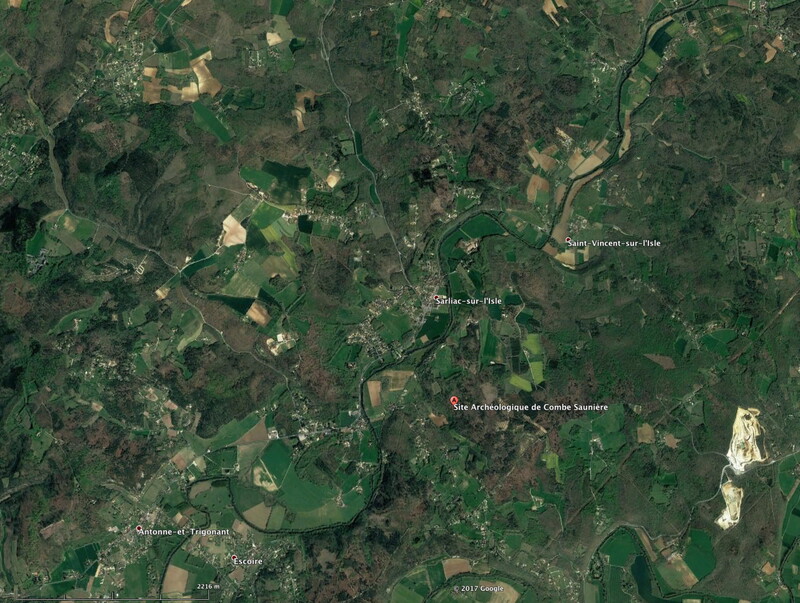 Location of Combe Saunière, No. 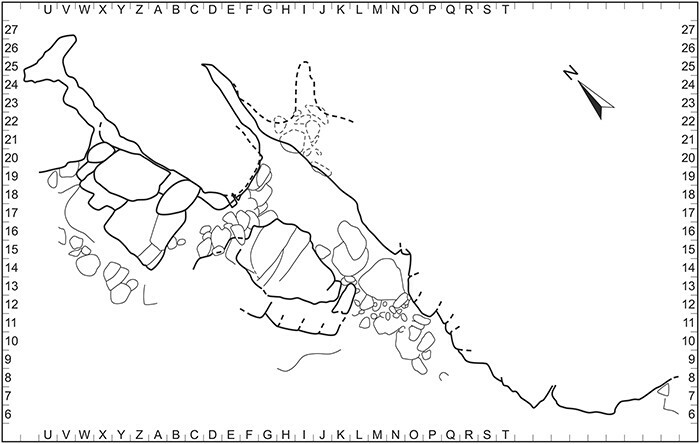 3 on this map of Solutrean sites in Southwest France. 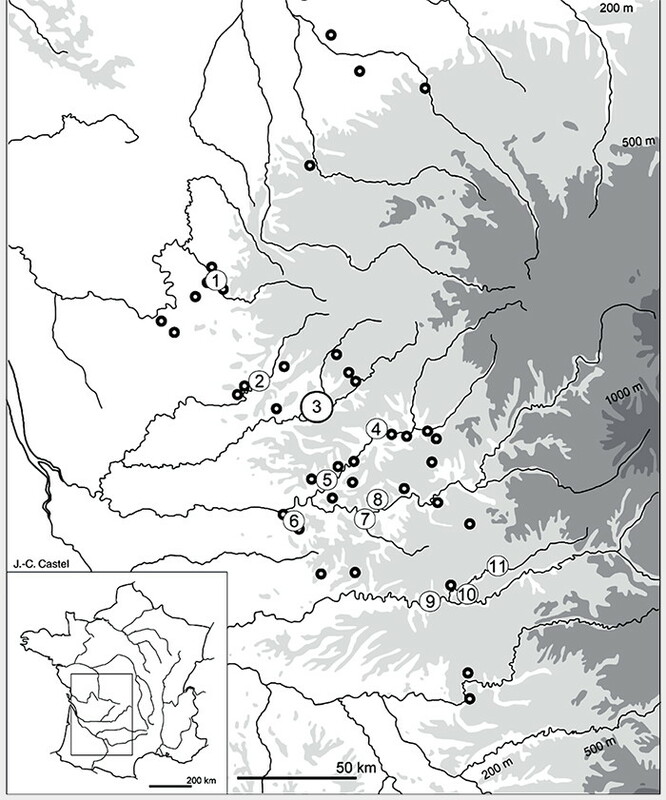 Location of Solutrean sites in Southwest France (black circles). 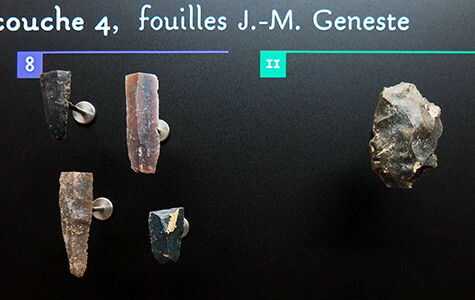 Numbers 1-11 are sites with well preserved faunas: 1 Le Placard; 2 Le Fourneau-du-Diable; 3 Combe Saunière; 4 Badegoule; 5 Laugerie-Haute; 6 Les Jamblancs; 7 Grotte XVI à Cénac; 8 Pech de la Boissière; 9 Le Cuzoul de Vers; 10 Les Peyrugues; 11 Sainte-Eulalie. 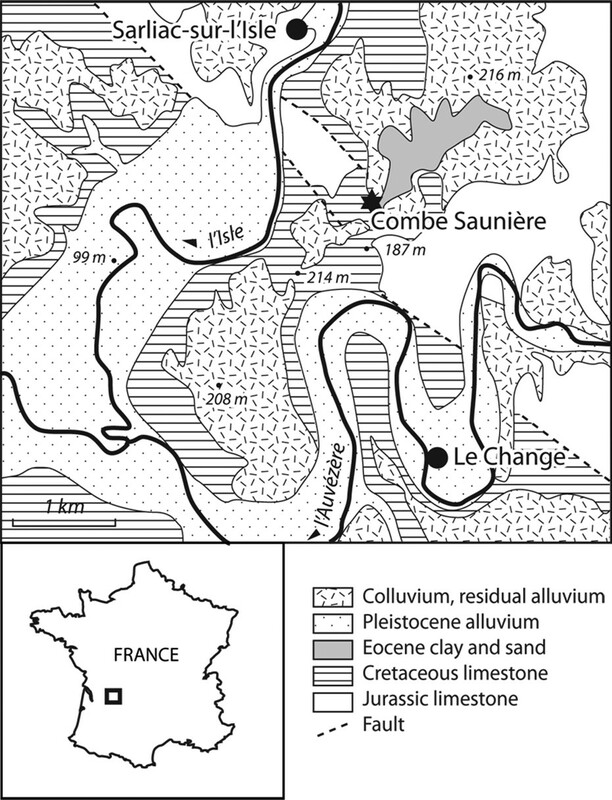 The stratigraphy of Combe Saunière. 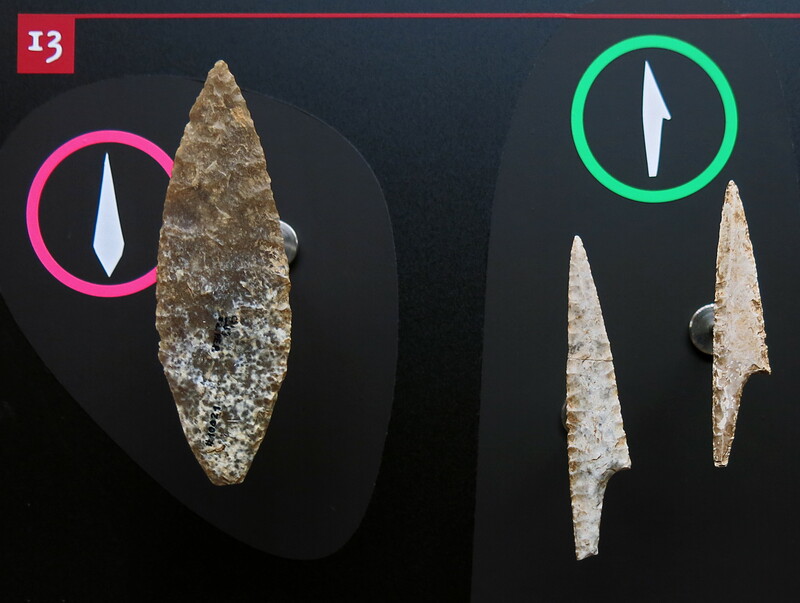 Bronze Age and historic layers omitted for clarity. Jean-Michel Geneste, one of France's foremost archaeologists and an expert on Rock Art, on the set of 'Cave of Forgotten Dreams'. 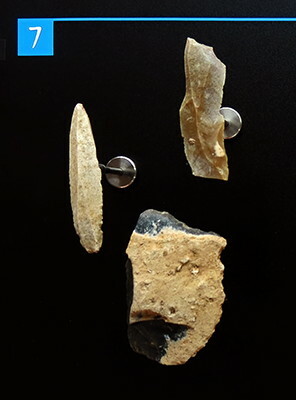 Curator then research director of the cave of Lascaux, he has been for more than two decades attached to the archaeological study of decorated caves. 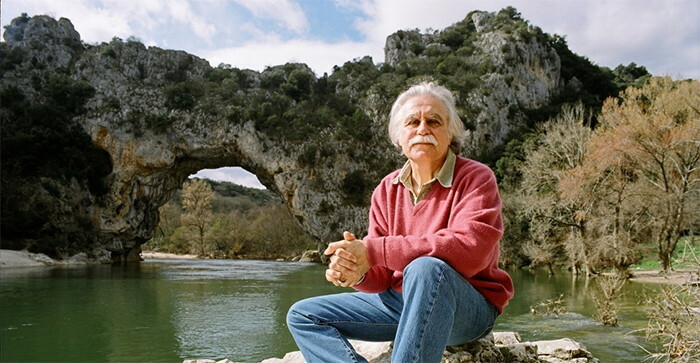 He has directed the multidisciplinary study program at the Chauvet-Pont d'Arc cave since 2002. He has coordinated archaeological research programs in France, Ukraine, South Africa, Papua New Guinea and currently in Arnhem Land, Australia. He has edited books on the Palaeolithic and Rock Art and has published a large number of articles. Jean-Michel Geneste went to Chauvet cave to study the archaeological remains including the lithic and bone industries and their distribution at the site, whose analyses he coordinated with the researchers involved, leading to the determination of the supply territories used by groups occupying the cave. Combe Saunière, layer 4, excavations of J.-M. Geneste. 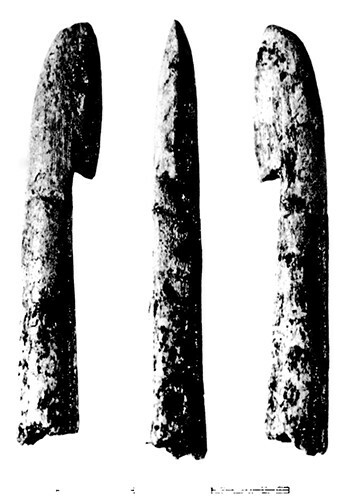 Age: Solutrian, circa 19 000 BP. Solutrean pointes à cran from layer 4, with characteristic flake scars and impact striations. 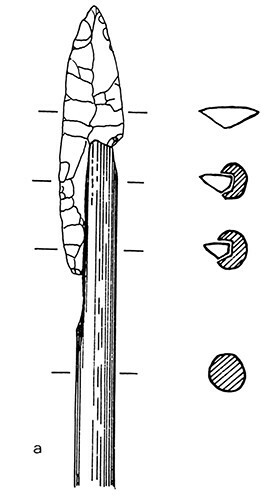 Method of attachment of a pointe à cran. Putting a groove in the shaft of the dart and gluing the pointe à cran to the shaft using pine resin took about fifteen minutes work. 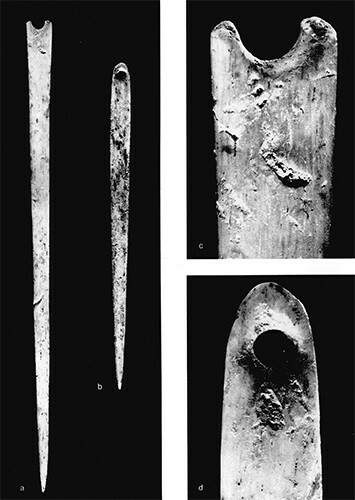 On the left is a piece of reindeer antler, possibly with shallow engraving, on the right a crochet or hook from a propulseur, or spear thrower, the earliest such example extant. 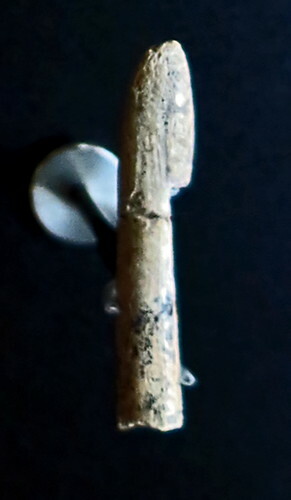 The oldest known propulseur or spear thrower, dating from the upper Solutrean, and coming from layer 4 of Combe-Saunière. 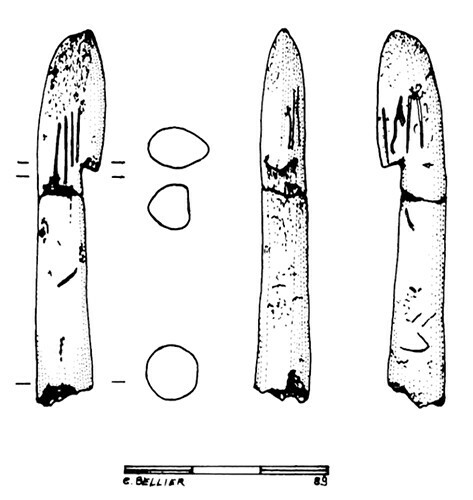 In 1986, a small hook made in reindeer antler was found in the Upper Solutrean level of the Combe-Saunière 1 cave (Dordogne). 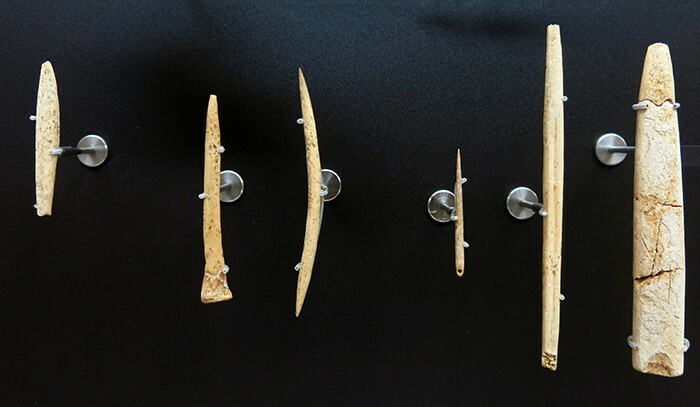 The morphology and dimensions of the object denote a perfect integration within the series of palaeolithic and precolumbian spearthrowers in antler. It shows a particular similarity with three palaeolithic spearthrowers found in the Placard cave (Charentes) in the XlXth century. Experimental reconstruction demonstrates its efficiency. 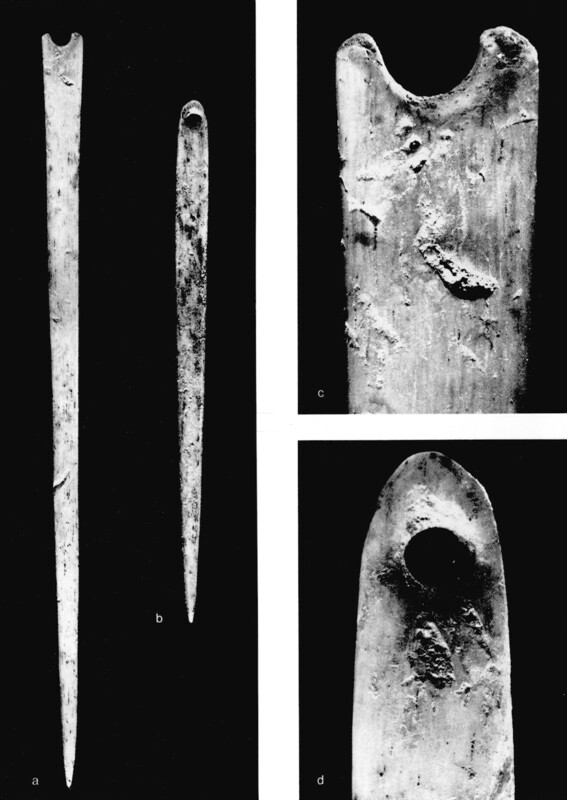 In addition to the abundant representation of spear points (37 examples were found), five needles were found in layer 4, and three of them have an eye, although one is broken. These latest discoveries, together with those of Laugerie-Haute Est and the Fritsch shelter confirm the appearance of this type of object at the end of the Solutrean. 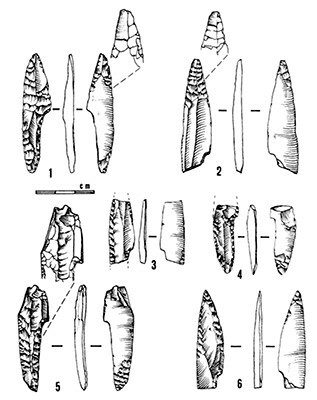 Rillardon M., 2010: Environnement et subsistance des derniers chasseurs-cueilleurs dans la basse vallee dur Rhone et ses Marges du Pleniglaciaire superieur (20 ka BP) à l'optimum climatique (8 ka BP), Archéologie et Préhistoire, Aix-Marseille Université, 2010.